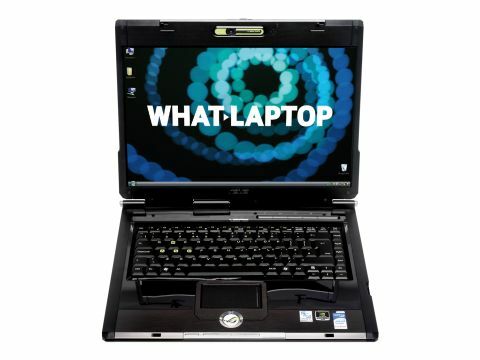 The previous generation Asus G1 was the company's first foray into laptop gaming. The latest iteration, the G1S (£1399 inc. VAT), is identical in appearance, but offers updated components. The G1S is aimed at the casual gamer. In place of the 17 and 20-inch displays of its rivals, you'll find a 15.4-inch panel. This helps to keep the overall weight at a semi-portable 3.3kg, making this a machine you can actually take on the road with you. Despite the difference in size, the G1S' display is still impressive. Colours are lifelike, thanks to a glossy Super-TFT coating. The smaller chassis means you won't find a top-of-the-range graphics card, but the Asus benefits from being the only laptop here to feature an Nvidia GeForce 8M Series card - the mid-range 8600M GT. This GPU is hardware-enabled to use DirectX 10 (DX10), making it better equipped to handle games and Windows Vista, as you would expect from a mid-range chip. 3D performance was less impressive than rival machines, but you'll still be able to play the latest games. With an HDMI port built in, you'll also be able to watch any high-definition movies you download on an external display. The Asus is a stylish machine, finished in a textured-look plastic and brushed aluminium. In keeping with many gaming laptops, you'll find coloured lights around the chassis, and the WSAD keys are highlighted. Build quality is high and the chassis feels sturdy to the touch. There's no numeric keypad, although there's not much space on the compact chassis to accommodate one. The keys are spacious, firmly attached and move quietly. They also offer a decent amount of travel, making typing a comfortable experience. Despite the compact chassis, cooling is well managed, and the G1S never got overly warm, even when running games. It uses Intel's fourth-generation Centrino Duo platform. With a 2.2GHz Intel Core 2 Duo processor and 2048MB of memory, this machine runs Windows Vista better than its rivals, booting quickly and running applications smoothly. The 160GB of storage space is average, offering plenty of room for your files and games. The Centrino Duo platform also features a draft-n wireless adapter - giving the Asus the fastest possible wireless network connections. The G1S isn't the best gaming machine around, but then it was never designed to be. Performance is excellent for such a compact chassis, and as an all-rounder, this is a decent laptop.